Fall flowers – a lot of gardeners seem to miss out on them. As August comes to the perennial garden, they’re ready to throw in the towel. It’s a shame: for northern gardeners the growing season is short enough, so why not extend the flower show well into fall with some lovely late-bloomers and ornamental grasses? I’m enchanted with the autumnal look pioneered by garden designers Wolfgang Oehme and James van Sweden in the United States, and Piet Oudolf, in Holland. I’ve designed my own garden to be at its peak in late summer because I adore fall flowers and the ornamental grasses that look so good with them. For the most part, plants that bloom in late summer and fall are tough, drought tolerant and many of them grow tall and dramatic. Another interesting thing about many of these fall flowers is how many of them are North American natives, which probably accounts for their toughness: they shrug off the drought, heat and humidity of our summers because that’s the very climate that shaped their evolution. With their clouds of daisy-like flowers in pink, rosy-lilac or deep purple, asters are classic fall flowers. Robust and hardy, many garden hybrids stem from the native New England and New York asters. Old favorite taller varieties growing 3 to 4 feet tall include the glowing salmon-pink ‘Alma Potschke’ and the lavender-blue Aster frikartii ‘Mönch’. The more recently introduced ‘Purple Dome’ grows a compact 18 inches tall. Asters thrive in full sun in moist, rich soil, but can look a little weedy during the growing season, so tuck them in among other earlier-flowering perennials. In late June, pinch or prune stems back by half to prevent floppiness and stake taller varieties. 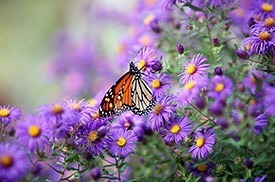 Keep asters vigorous by dividing in spring every two or three years. Some of the older varieties were plagued by mildew, but newer ones are resistant: look for Aster laevis ‘Bluebird’, with single violet blue flowers, Aster lateriflorus ‘Prince’, which has unusual dusky plum-purple foliage and tiny white star-like flowers with a raspberry colored eye, and Aster oblongifolius ‘October Skies’, which has blue flowers in September to October. Another plant I wouldn’t be without has the unfortunate common name, Joe Pye weed. But this North American native is not the least weedy. Its botanical name Eupatorium is much more gracious, just like the plant. Tall (in the 4 to 5 foot range) and stately, it’s a real butterfly magnet for almost six weeks in late summer when its large heads of tiny, dusky pink flowers bloom. A widely available cultivar is ‘Gateway’. For gardeners looking for more compact versions, a recent cultivar, ‘Phantom’, is supposed to grow only 3 feet tall. This perennials makes a terrific accent plant and mixes well with other late season stars, such as Echinacea, Rudbeckia ‘Goldstrum’, Sedum ‘Autumn Joy’ or ‘Matrona’ and ornamental grasses. For show-stopping daisy-like flowers in hot colors, try hybrids of the North American native, Helen’s Flower (Helenium autumnale). ‘Bruno’, a Bressingham selection from England has crimson-mahogany flowers; ‘Red and Gold’ produces brick red and gold yellow flowers; ‘Butterpat’ has deep yellow flowers and ‘Moerheim Beauty’ bright, reddish-orange blooms. About 3 to 4 feet tall, heleniums complement autumn’s palette of golds, crimsons and oranges. These late summer to fall flowers thrive in full sun in moist humus-rich soil. Regular moisture is important, so don’t let them dry out in summer. The is one of the new generation of goldenrods that I hope will help gardeners overcome the prejudice against these plants as mere roadside weeds. Goldenrod is unfairly blamed for causing hay fever. Ragweed, which blooms at the same time, is the real culprit. ‘Crown of Rays’ is clump-forming goldenrod hybrid with many tiny, bright yellow flowers on dense, horizontal, plume-like panicles. This late summer to fall flowering perennial thrives in full sun and well-drained soil and grows about 24 inches tall. Plants may need to be divided every 2 to 3 years to control growth. Russian sage is a fall flower with a very long bloom time. The plant grows upright and has attractive lacy-looking greyish leaves that smell like sage. Violet-blue flower spikes appear in mid-summer and continue well into fall. This drought-tolerant perennial grows well in sunny, hot, dry sites. It is a good butterfly plant, and deer-resistant. Grows about 3 feet tall and 24 to 30 inches wide. Don’t cut back in fall; wait until spring and then cut to 6 inches from the ground. More growing information on Russian sage. This is a lovely selection of a North American native wildflower. Growing tall – about 4 to 5 feet, but with strong stems that usually don’t require staking – the plant bears large branching spikes of lilac-mauve flowers in mid to late summer and continue into early fall. The flowers arch gracefully at the tips – they look a bit like mermaid’s tails – and make good cut flowers. Also attractive to butterflies, and deer-resistant. Adaptable to most soils; grow in full sun. For shadier spots in the garden, consider delicate-looking fall-flowering Japanese anemones. Growing 2-1/2 to 3 feet tall, these fall flowers grow on slender, branching stalks, and spread to form a large patch. Lobed leaves form attractive mounds of foliage, and the flowers look poppy-like. Favorite cultivars are silvery-pink ‘September Charm’, light pink ‘Queen Charlotte’ and glowing white ‘Honorine Jobert’. Plant Japanese anemones in rich, moist, well-drained soil, where they’ll have afternoon shade. Anemones benefit from a winter mulch and regular deep watering in dry weather. Dramatic and upright-growing Karl Forester feather reed grass (Calamagrostis x acutiflora ‘Karl Forester’). The white and green variegated Morning Light miscanthus (Miscanthus sinensis ‘Morning Light’). Tall airy cultivars of purple moor grass (Molina caerulea) seem always to be in motion. Look for cultivars ‘Transparent’, ‘Skyracer’, or ‘Windspiel’, German for “wind play” – a terrific description of the wonderful dance of grasses on the breeze. Dallas Blues switch grass (Panicum virgatum ‘Dallas Blues’) and North Wind upright switch grass (Panicum virgatum ‘Northwind’) are two more excellent choices. Is fall planting of perennials and trees and shrubs really a good idea?